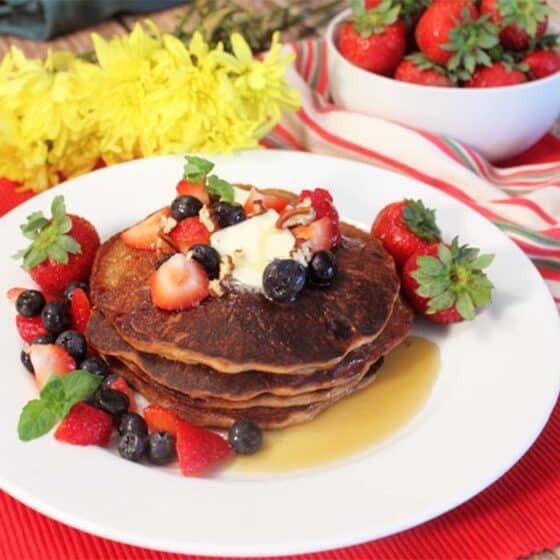 Start your day off with healthy high protein pancakes. They are packed full of protein, calcium, useful carbs & only a little sugar. Make the dry mix ahead of time & add liquid ingredients when you're ready for a fast start in the morning. Combine all dry ingredients in large bowl. At this point you can store the mixture in the pantry until you are ready to use. When ready to make pancakes, mix all wet ingredients and banana together. Add to dry mixture and stir well to combine. Heat griddle pan on medium heat. Coat with little butter or coconut oil. When drop of batter dropped onto pan sizzles and begins to cook immediately it is hot enough to start the pancakes. Pour a little at a time on the hot griddle until you have the size pancake you want. Smaller pancakes are easier to turn and cook slightly faster. Wait until you see bubbles across the entire top surface before flipping. Cook until bottom is brown, usually about 2 minutes. Remove to plate and serve with butter, maple syrup or fresh fruit such as blueberries, strawberries or raspberries. Makes about 16 pancakes, 4 per serving.